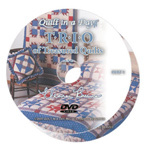 Three favorite, traditional patterns, Monkey Wrench, Ohio Star and Bear's Paw, are featured in the Trio of Treasured Quilts book. 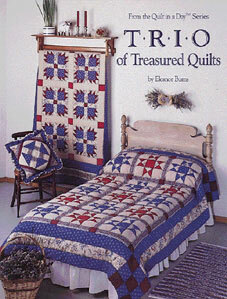 This revised edition uses Eleanor's latest techniques with complete, quick cutting and fast piecing methods. Make one block or a whole quilt following the detailed yardage and cutting charts and assembly-line sewing techniques. A unique method for putting batting between the quilt top and backing is described. Other projects include pillows, aprons, tablecloths and wallhangings.